Georgia O‘Keeffe produced more than twenty scenes of New York City between 1925 and 1930. Here, the power and presence of the modern era are epitomized in the city’s thrusting architecture. During the first half of the 1900s, skyscrapers came to exemplify U.S. ingenuity. 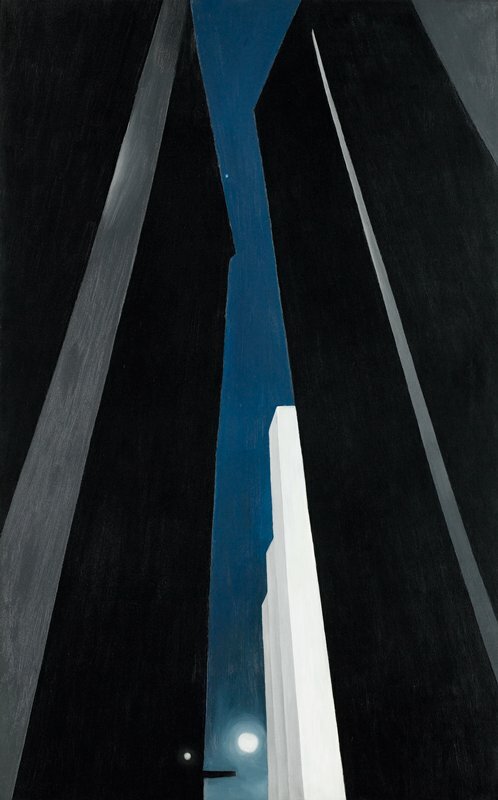 O’Keeffe reduced these immense buildings to simple geometric forms that converge in the upper reaches of the dark canvas, towering even above the moon. She places the viewer between these architectural giants. We might feel small in their midst, forced to crane our necks skyward to take it all in, or we might marvel at the staggering feats of engineering that soar above our heads. The brightly glowing moon offers a round contrast to the super-straight lines of the city.